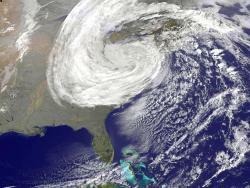 Sandy seen from space: This satellite photo shows the enormity of Sandy as she slammed into the east coast of the United States.Courtesy NASAI'm always skeptical about storms that get a catchy nickname before they strike. The hype always seems to be more than the outcome. But Sandy (aka Frankenstorm) seems to be living up to her billing. After coming ashore the New Jersey/New York area early Monday evening, her path of destruction is wide and intense. As of noontime Tuesday, the fatality toll had risen to 33 people. Here's a round up of news sources reporting the impact of this major storm. Converging factors – A nice recap of the meteorological conditions that combined to make this storm so strong. The pre-storm view from crew members aboard the International Space Station. Slide show of photos from damage in the New York City area. Slide show of photos of damage up and down the eastern seaboard. In some ways, Sandy will be much like "The Perfect Storm" of 1991, when the remnants of Hurricane Grace interacted with a cold front that moved through the Northeast. As tropical system (strengthened by the warm ocean waters) merged with the cold front, it became more of an typical Mid-Latitude Cyclone (strengthened by the large temperature difference across the front). Interestingly, the center of the storm (minimum central pressure of 972mb) stayed off shore and caused massive damage (estimated to over 200 million dollars with 13 dead). This storm (hybrid Sandy) is expected to MAKE landfall; some models forecasting the central pressure down near 950mb, much lower than that of 1991. You can read more of his insights on Sandy here. In Chicago today, big waves – Sandy's stretching into the midwest, picking up 20-foot waves on Lake Michigan in Chicago. Expanded reporting of the final hours of the HMS Bounty – the replica of a historic tall ship which sank off the coast of North Carolina Monday. Top 10 rejected storm names – and on a lighter note, Dave Letterman goes low-tech to share rejected names for this super storm. In the quest for developing better building methods to withstand hurricane winds, this experiment with about 100 high-powered fans shows what happens to a non-hurricane-proofed home vs. one that's using special building methods. It's estimated the winds got up to 96 mph in this test, equal to a Category 2 hurricane. Tropical Storm Alex, which formed over the northwestern Caribbean Sea out of a westward-moving tropical wave on Friday and Saturday (June 26 and27), emerged overnight into the Bay of Campeche from the Yucatan Peninsula. Since emerging from that landmass as a tropical depression (signifying sustained winds weaker than 35 knots), it has strengthened back to Tropical Storm status. Current forecasts place it as a hurricane — possibly major — near the northern Mexico Gulf Coast later this week. Haiti housing resourceCourtesy jasonpearce Housing for Haitians may already be on hand. 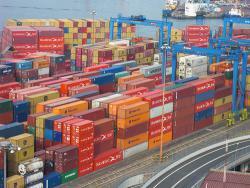 Sturdy, earthquake and hurricane proof, shipping containers often sit empty in port yards because exporting empty containers is not cost effective. Pernille Christensen, at Clemson’s School of Architecture, along with Martha Skinner and Doug Hecker, have been working to develop a method to convert the shipping containers into homes. “Because of the shipping container’s ‘unibody’ construction they are also very good in seismic zones and exceed structural code in the United States and any country in the world,” associate professor Hecker said. I have a friend in Taiwan who told me he was deeply concerned about an approaching typhoon. The big storm has caused some huge problems as some sections of the island nation received 80 inches of rain over the weekend. Here is some CNN video of the impact the storm has had. 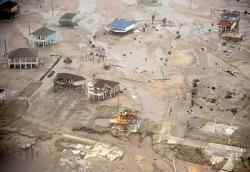 More than 600 people in a village were buried in a mud slide. Here's a full report. The 2008 Atlantic hurricane season has now ended. It was one of the busiest and costliest hurricane seasons ever. 2008 was "the only year on record in which a major hurricane existed in every month from July through November in the north Atlantic." According to the National Climatic Data Center, damages are estimated at $54 billion. That total is second only to 2005 which had Hurricanes Katrina and Rita. In all, there have been 16 named storms since the Atlantic hurricane season started on June 1. Eight were hurricanes, five of them major -- meaning Category 3 or higher. Three -- Dolly, Gustav, and Ike -- made landfall in the United States, though none was a major hurricane at the time of landfall. Hurricanes gather heat and energy through contact with warm ocean waters. Evaporation from the seawater increases their power. Hurricanes rotate in a counter-clockwise direction around an "eye." The center of the storm or "eye" is the calmest part. It has only light winds and fair weather. When they come onto land, the heavy rain, strong winds and large waves can damage buildings, trees and cars. A graduate student at MIT has developed software that will help emergency managers plan better, safer, more efficient evacuations.